Can I put Child Car Seats in My Pickup? If you don’t have to put your child in the rear bed of a pickup – don’t! A child will never be safe in a pickup truck even those with a backseat. A regular car offers the best safety for a young child if they are in the back seat. Most any parent with just a dab of common sense knows, or should know, that the open or closed bed of a regular pickup truck is no place to put a young child if you wish to consider “safety.” Actually, that same comment can apply to any passenger for that matter even it they are hollering and you’re trying to keep your “cool” while driving. The fact is that all 50 states prohibit a child from riding in the “cargo” area of a pickup truck. Of course, we all know that so-called “laws” are hardly ever enforced especially during summertime by law enforcement and parents alike. These type of trucks seem to be the “flavor” of the year since a full-size pickup comes with a full-size backseat allowing you to eschew the worry about safety for a child. 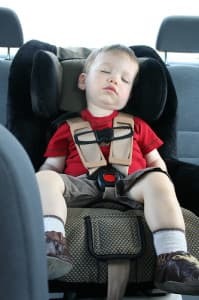 Note: The same seatbelt laws of your state will apply to those young ones (toddlers, preschoolers and infants) like any other passenger who buckles up per state laws. That said, you can interrupt this statement to mean that NO child should be riding in the “cargo” area of a truck. On the other hand the law of the land suggests that if the backseat of your pickup truck won’t handle the usual seat your child rides in, the option for you is to place him or her in the front seat. Also if your pickup truck does not have a backseat, you child can legally sit in their approved safety seat in the front with an adult. The smart move is to know your particular state regulations when it involves pickups and child car seats.